With the Bank of Canada cutting interest rates again this week, talk has turned to what it means for the housing market — and whether lower interest rates will lead to a housing correction. Undoubtedly the last interest rate cut, back in January, spurred strong price and sales growth. In a report issued Friday, TD Bank said mortgage rates effectively fell 0.55 percentage points since January, even though the BoC’s January cut was just 0.25 percentage points. That may explain why detached home prices in Toronto and Vancouver are growing at double-digit rates, and why housing starts hit a 10-month high in June, of nearly 203,000 new homes. But according to prominent real estate analyst Ben Rabidoux, those housing-starts numbers are a problem. That’s because the working-age population, which does most of the home-buying, has gone from growing much more quickly than usual a few years back, to growing much more slowly today. So Canada is building far too many houses, Rabidoux says. “We’re currently building over two new houses for every person we’re adding to the working-age population,” Rabidoux wrote in a column for the Globe and Mail. Population growth in this group is growing at a third of the normal rate, Rabidoux said. Rabidoux produced data showing the proportion of new housing starts to population growth. The data shows a sudden spike — i.e., a sudden oversupply in the market — over the past year. In a report last year, the Bank of Montreal made a similar argument. Economist Robert Kavcic noted that the 25-34 age group that does most of the first-time home buying in Canada was growing much faster than usual (and much faster than in the U.S.) in recent years, but that trend is now reversing. Kavcic produced a chart showing that population growth among first-time home buyers peaked around 2010, and has begun falling. He forecast that Canada’s housing market would move into a protracted slump starting in 2018, as fewer and fewer young Canadians are available to buy homes. 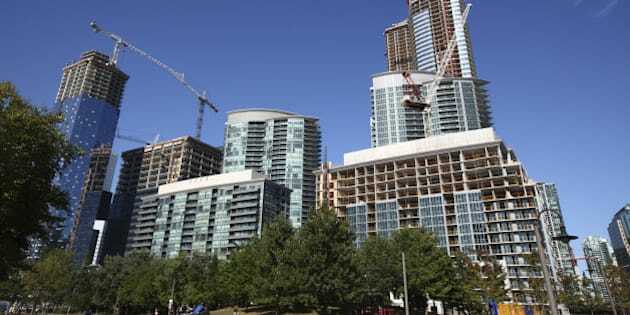 But Hilliard MacBeth, an investment advisor and author of the recently-published “When The Bubble Bursts: Surviving The Great Canadian Real Estate Crash,” says the correction is likely to start this summer. Canadian banks are “willing to lend up to five, six times the annual combined income of a two-income family,” he said on BNN this week. MacBeth said banks are willing to lend large amounts because “they can offload the risk on to the CMHC,” he said, referring to Canada’s government-run mortgage insurer. For the moment, MacBeth is in the minority, and most economists continue to forecast growth for the housing market, albeit slower than what has been seen recently. In its report Friday, TD Bank said the Bank of Canada’s cut to interest rates Wednesday will have little impact on the housing market, but mortgage rates have come down by 0.55 percentage points since the start of the year, and that is having an impact. “Based on historical experience, mortgage rate changes of this magnitude can boost demand for housing by 10 per cent to 15 per cent over a six-month period,” economists Beata Caranci and Diana Petramala wrote.